INTRA GROUP is the well-known manufacturer of Heavy Engineering Equipment in Hyderabad. Heavy Engineering Equipment is the backbone for entire engineering sector. Heavy equipment industry has seen a surge in demand for heavy equipment from both the developing economies and the industrially established ones. Standardization of equipment by industry leaders has led to paradigm shift in engineering design. Growing demand, customization, the large number of components and sub-assemblies make engineering for vertical a unique challenge.INTRA GROUP emerged as a strong ENGINEERING base Company with an excellent reputation to supply Plant as well as Machinery to various customers in INDIA and ABROAD. 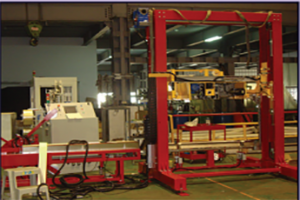 We focus mainly on innovative design and to work continuously on modernize and also to improve manufacturing facilities so that machinery which is installed after gives trouble free high performance.We have core Competency in sound design practices, stringent quality control at every stage of manufacture and also have the ability to make custom built machinery with the help of a highly qualified and dedicated team of about 150 persons.